Ryan Bell was in fine form for Derry until as they booked a place in the McKenna Cup semi-finals. 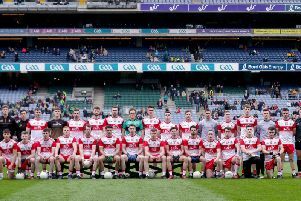 Derry advanced to a Dr. McKenna Cup semi-final date with Cavan following a less than impressive performance against Queen’s at Celtic Park on Wednesday night. The Oak Leafers made hard work of a game which Magherafelt’s Conor Kearns stole the show with a superb display and five point from play on his senior debut. In all, Damian Barton made 12 changes to the team that started against Tyrone on Sunday and handed competitive full debuts to keeper Ciaron O’Boyle, corner-back Peter Quinn, Claudy midfielder Shane McGahon, and forwards Shane Mulgrew, Gavin McWilliams and Kearns. Yet it was the Students who started the brighter with Dermot McAleese firing over a point after only 17 seconds. Chrissy McKaigue had Derry level within a minute but there was little between the teams in the early exchanges. Enda Lynn was enjoying plenty of room in a new deep lying playmaker role but Derry never got the scores they should have as the half wore on. Gerard McGovern’s point had Queen’s back in front but Mark Lynch, who started in a two man full forward line with Shane Heavron once again brought the home side level. Ryan Bell and Neil Forester both scored lovelypoints but just as it appeared the Oak Leafers were starting to get to grips with the game they conceded a soft 16th goal which Lavey keeper O’Boyle will not have been happy with. There seemed to be little danger when a long ball was floated toward the Derry posts from wide on the right flank but as he came to collect, O’Boyle hesitated and allowed Queen’s forward McGovern to dive in and flick the ball past him and into the net for a 1-02 to 0-4 lead. Magherafelt forward Kearns was finding plenty of space in the half forward line and had Derry level soon after while it took a superb stop from Queen’s keeper Jonathan Deeney to stop Lynn finding the net with a fiercely struck shot. Shane Mulgrew and Queen’s Ciaron Harney swapped scores but despite being well on top, a lack of urgency from the home side was keeping the visitors in the game. Lynch edged Derry in front again from a free before two superb Kearns points put them 0-9 to 1-03 up on 26 minutes yet again they allowed James McCartan’s team back into the game. Harney and Martin Clarke brought it back to a one point game before Shane McGahon struck the point of the half off the outside of his right foot for Derry to end a half in which the Oak Leafers never got out of third gear. The half-time team talk seem to have the desired effect for Derry who set about the second period with a much greater intensity. That man Kearns got the scoreboard moving with another excellent point after Bell had won possession on half-way and seconds later Kearns was returning the favour by setting up the big Ballinderry forward for his second point. Slaughtneil’s Brendan Rogers replied for the Students with an audacious score as, not for the first time, Derry were guilty of taking their foot off the accelerator. Michael O’Kane, who had replaced O’Boyle in the Derry goal at half-time, gifted Queen’s Shea Heffron a point with a poor kick before Clarke’s brilliant free made it 0-12 to 1-08 after 45 minutes. Bell’s third score of the day was his best but even it had to play second fiddle to a huge point from substitute James Kielt which threatened to clear the ground. A needless second yellow card for Queen’s midfielder Anthony Doherty looked to have killed off the visitors, especially when Kearns and substitute Niall Loughlin put Derry 0-16 to 1-08 up. Shane Heavron’s first point of the game looked to have wrapped things up until O’Kane let Dermot McAleese’s shot slip thorough his fingers for a second Queen’s goal which made the last few minutes more nervous than it should have been. Needless second bookings for Bell and Che Cullen saw both players depart early after the continued an earlier scuffle but it was only seconds before the final whistle confirmed Derry’s place in the last four.